These unique films reveal the mysteries of weaving techniques from across the world in a double disc set. Filmed entirely on location in villages in Africa, Asia, South and Central America World Weaving shows some of the most beautiful hand woven textiles being produced and worn in their countries of origin. Backstrap, Frame and Treadle looms from Mexico, Guatemala, Peru, Bolivia, Turkey, India, Burma, Thailand, Laos, Indonesia, Ghana. Warping processes for a scaffold warp, four sevedges on a backstrap loom, Kente and kilim weaving, for silk and cotton supplementary warp and weft weaving. 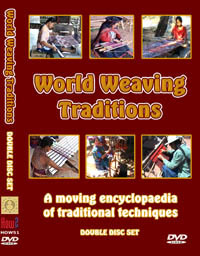 Weft faced patterning by slit and interlocking tapestry, supplementary weft including Guatemalan brocades and Turkish cicim and carpet weaving. Warp faced patterning by pick up techniques including rare footage of Bolivian pick up weaving, supplementary warp weaving, Kente weaving, and finishing a four selvedge weaving. Ikat patterning by weft ikat in Thailand and India, warp ikat in Sumba, and double ikat in India and Bali. EOE017 135 mins DVD Price £25 double disc set.